The High Line project is a dream come true – an abandoned elevated rail line rediscovered by a neighborhood writer and painter, saved from demolition by community advocates, and preserved and transformed into what’s being called New York City’s great new park - "a space borrowed from early generations, cleaned-up in ours, and handed to the one that follows". It’s the success story we seek for the Public Promenade on the Memphis riverfront and for greenways and parks city and county-wide. Click below for the New York Times article, some FAQs, and a link to the High Line website. Standing on a newly renovated stretch of an elevated promenade that was once a railway line for delivering cattle — surrounded by advocates, elected officials and architects who made the transformation happen — Mayor Michael R. Bloomberg cut a red ribbon on Monday morning to signify that the first phase of the High Line is finished and ready for strolling. 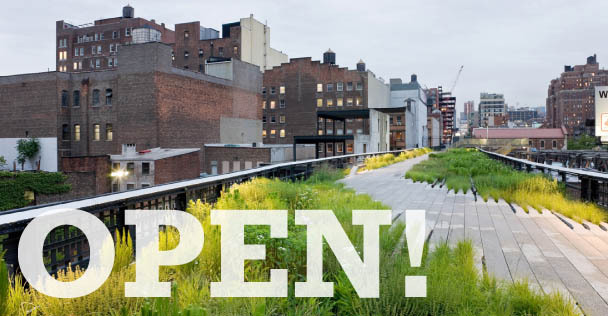 The first portion of the three-section High Line, which runs near the Hudson River from Gansevoort Street to West 20th Street, will be open daily from 7 a.m. to 10 p.m. There are entrances at Gansevoort Street (stairs) and at 16th Street (elevator); exits are located every few blocks. The second phase, which extends to 30th Street, is under construction and expected to be completed by fall 2010. The third phase, up to 34th Street, has yet to be approved. The High Line project is something of a New York fairy tale, given that it started with a couple of guys who met at a community board meeting in 1999 — Joshua David, a writer, and Robert Hammond, a painter — and discovered they shared a fervent interest in saving the abandoned railroad trestle, which had been out of commission since 1980 and was slated for demolition during the Giuliani administration. That began a decade-long endeavor that involved rescuing the structure and enlisting the Bloomberg administration in its preservation and renovation. With all the bureaucratic hurdles that the project had to overcome, it was fitting that so many representatives of different arms of local government were there for Monday’s celebratory news conference, including Amanda M. Burden, the city planning commissioner; Adrian Benepe, the parks commissioner; Representative Jerrold Nadler, Democrat of New York; and Seth W. Pinsky, the president of the New York City Economic Development Corporation. Also present were two couples who have been the project’s major benefactors — Diane von Furstenberg, the fashion designer, and her husband, the media mogul Barry Diller, and Philip Falcone, a hedge fund billionaire, and his wife, Lisa Maria Falcone. The walkway, designed by James Corner Field Operations and Diller Scofidio & Renfro, includes more than 100 species of plants that were inspired by the wild seeded landscape left after the trains stopped running, Mr. Bloomberg said. He added that the High Line has helped to further something of a renaissance in the neighborhood; more than 30 new projects are planned or under construction nearby. One of those projects includes a new satellite for the Whitney Museum of American Art, designed by Renzo Piano, which will anchor the base of the High Line at Gansevoort. The mayor announced on Monday that the city was finalizing a land sale contract with the museum. The first two sections of the High Line cost $152 million, Mr. Bloomberg said, $44 million of which was raised by Friends of the High Line, the group that led the project. What’s the High Line? The High Line, a 1.45-mile-long elevated rail line has become New York currently runs from Gansevoort Street, in the Meatpacking District, through the West Chelsea gallery neighborhood, ending at 34th Street, next to the Jacob Javits Convention Center. The last train ran on it in 1980. How did it Happen?Friends of the High Line, founded in 1999, is a community-based 501(c)(3) organization dedicated to the preservation and reuse of the High Line. Friends of the High Line began as an advocacy group and is currently undergoing a transition to a conservancy, working to raise funds and help operate the park through a partnership with the New York City Department of Parks & Recreation. Friends of the High Line successfully worked with the mayoral administration of Michael Bloomberg and the New York City Council to reverse a City policy favoring demolition to one ensuring the High Line's preservation through the federal Railbanking program. Friends of the High Line also spearheaded the design process for the High Line's transformation to a public park, partnering with the City of New York on an international design competition that eventually selected the team of James Corner Field Operations (landscape architecture) and Diller Scofidio + Renfro (architecture). Construction began in April 2006. Section 1 (Gansevoort Street to 20th Street) is projected to open in June, 2009. Section 2 (20th Street to 30th Street) is projected to open in 2010. Has an elevated rail structure been made into a park before?The city of Paris successfully converted a similar rail viaduct into an elevated park called the Promenade Plantée. It is lavishly planted and offers both stairs and elevators for access. Projects similar to the High Line are in early stages in St. Louis, Philadelphia, Jersey City, Chicago, and Rotterdam, among others. The official High Line website tells the story: history, photos, videos.